The Battle of Raphia, also known as the Battle of Gaza, was a battle of the Syrian Wars between Ptolemy IV of Egypt and Antiochus III the Great of the Seleucid kingdom. Fought on 22 June 217 BC near Gaza. Ptolemy had 70,000 infantry, 6,000 cavalry, and 73 war elephants. 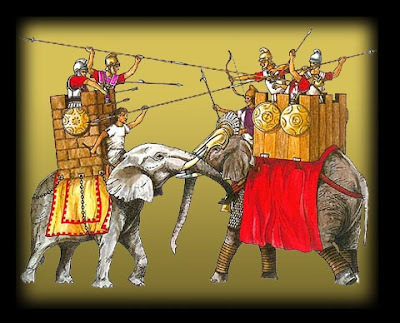 Antiochus had 62,000 infantry, 6,000 cavalry, and 103 elephants. At this time war elephants were exclusively supplied from India. To maintain their monopoly over the industry the Indians only exported male elephants. Ptolemy, who had no access to Indian elephants, may have used smaller African Forest elephants, or may have trained female elephants. The kings split their elephants between the wings of their army. Antiochus began winning at the beginning of the battle when Antiochus's larger elephants drove off Ptolemies elephants. Each army's right wing defeated the opposing left wing and drove it from the field, leaving the Ptolomid phalanx to defeat the Seleucid infantry. Ptolemy's victory kept the province of Syria for Egypt but it was only a brief respite; at the Battle of Panium in 198 BC Antiochus defeated the army of Ptolemy's young son, Ptolemy V and captured Syria and Judea. Ptolemy owed his victory in part to having a well equipped and trained native Egyptian Phalanx which formed a large proportion of his phalangites (exactly how much is subject to academic dispute). Also, the Seleucid elephants are recorded to have panicked and fled the battle according to some sources. The self confidence the Egyptians gained has been ascribed as one of the causes of the subsequent Egyptian Revolt.